Definition - What does Ovarian Stroma mean? 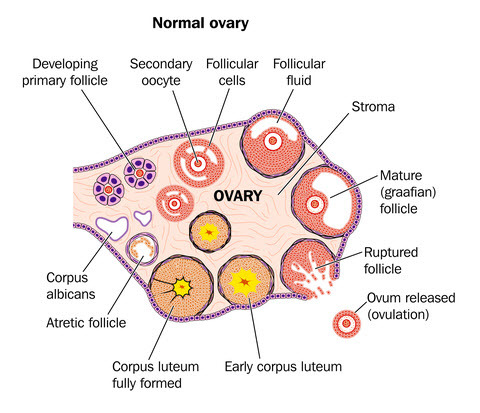 The ovarian stroma is the substance of the ovary—a connective tissue that binds structures together and is enriched with blood vessels, cells, and several hundred thousand follicles. The stromal cells play a role in follicle development where cells around the follicle bind with luteinizing hormone (from the pituitary) and produce androgens (male hormones). These androgens are converted into estrogen, which enters the bloodstream. The ovarian stroma can get enlarged in conditions like PCOS and hyperthecosis. The differentiation between the two conditions is important because the treatment differs. They are primarily differentiated according to their ultrasound features. In PCOS, the ovarian stroma becomes enlarged enclosing an increased number of small follicles that encircle the outer layer of the ovarian stroma and looks a lot like a string of pearls on an ultrasound. Moreover, the stroma appears increasingly bright and the blood flows at a considerably higher speed in polycystic ovaries than in normal ovaries because of the rich blood supply. In contrast to PCOS where luteinized thecal cells develop around the margin of the follicle, ovarian hyperthecosis is characterized by the presence of luteinized thecal cells within the ovarian stroma at a distance from the follicles. In both PCOS and hyperthecosis, these luteinized thecal cells produce excess amounts of androgens in response to a signal from LH, which contributes to the clinical picture of these conditions, including follicular arrest and disturbed ovulation.